The Grand Prix rally travelled through Maffra in 2002, 2003 and 2004. A night stage was held in the main street of Maffra which resulted in the Maffra and District Car Club (MADCC) providing a great display of private vehicles lining the main street. That evening there was a function in the Maffra Memorial Hall and three locals pondered the possibility of starting a new Motor Museum in Maffra to showcase all these local vehicles. The concept was born. The three locals were Foster Crooke, Peter McDavitt, and Peter Quennell. An inspection of a building was hastily arranged the following morning, 2nd April 2004, and it was agreed that this building was crying out to become a Motor Museum. 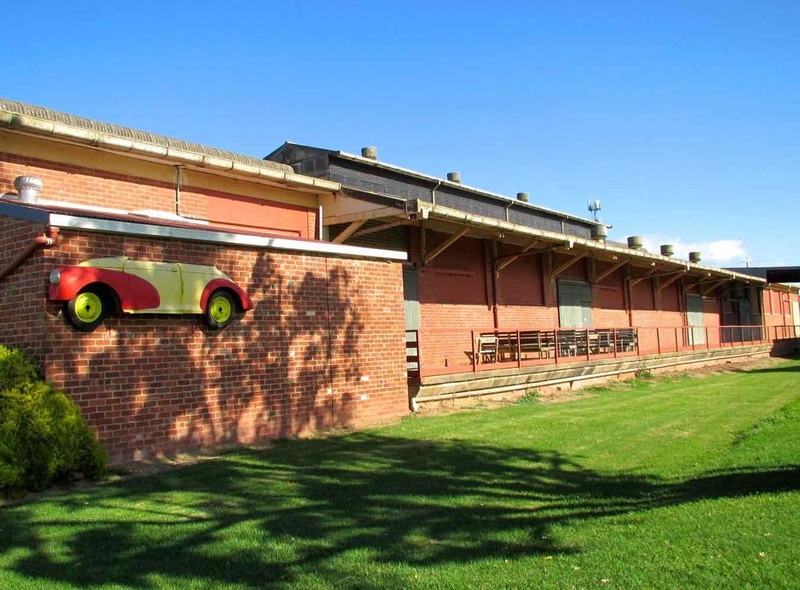 After meeting with Murray Goulburn over the next few weeks and months, they finally agreed to lease the building to the Motor Museum for a peppercorn rent. Initially, the Museum offered 100 foundation memberships at $100 per person. These seeding funds allowed them to start creating the dream. The Museum remains grateful to those individuals who shared the dream. The building was washed out by fire trucks, painted, rewired, windows replaced, doorways sealed, toilets built, and a kitchen installed. A security system was set up, lawns mowed, and trees planted. The result is what is seen today. ​Over the years, with the generous support of local businesses, volunteers and friends, the Museum has been able to undertake many varied improvements. An early anonymous supporter sent a bank cheque for $100,000. This encouraged continued development plans and ultimately these funds have been pivotal to the Museum's ability to purchase the building. So to the benefactor, the Museum members say a great thank you - you are an inspiration. Many other members of the community have given freely to help the Museum achieve it's aims, and the Museum members want to offer a huge thank-you to all of them, as well as the owners of the loaned vehicles that make up the displays, for their generosity and good will. This museum is founded on good wiill and generous community support. ​Gippsland Vehicle Collection - GVC. 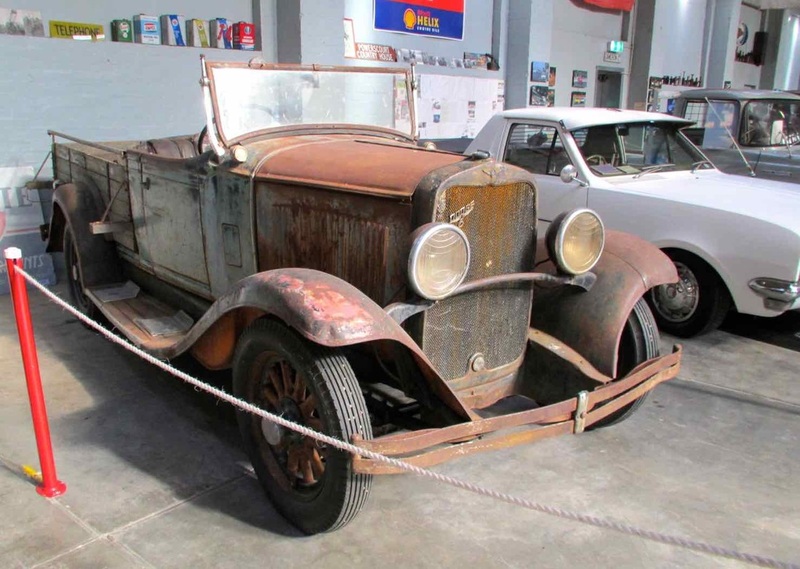 ​Gippsland Vehicle Collection - Maffra Shed. Just off the off the Princess Highway (A1) and pass the Avon Ridge Vineyard via Stratford - Maffra Road (C105). Note: Photo of Peter Quennell, Foundation Member, standing next to a 1928 Stutz BB Vertical 8. See photo below. August 1942 saw the lease agreement between the Commonwealth of Australia and the Agriculture Department of Victoria, to build a vegetable dehydration plant at Maffra, Victoria. ​October 1942, as reported in the Maffra Spectator: Plant to be established in Maffra. The urgency of vegetables, natural and other advantages of this district for the growing of and the treatment for subsequent use of vegetables were quickly apparent to Captain Jocelyn of the USA Navy Service, in a flying visit to Maffra on a special mission during the week. Although little or no opportunity was created by which Captain Jocelyn's desire could be ascertained and amplified, it was understood that he was most anxious to have the public know that the urgent necessity for growing vegetables could not be too greatly stressed and that obtaining of these was the utmost importance for the national war effort. So great is the urgency, owing to the demands already made on New South Wales and Queensland vegetable production, that it is recommended that lands at Maffra prepared for maize should be sown down in vegetables with the following priority - Carrots, Potatoes, Cabbage, Red Beet, Swede Turnips, Parsnips, Leeks and Onions. The sowing of these is to be arranged in a manner which enables deliveries to be spread to the dehydration plant which is anticipated to process 200 tons of vegetables per week. The national and the economic aspect of vegetable growing in the light of this development is such as must arrest the serious attention of every farmer with acreage for the purpose. It has been stated that the growing of vegetables in this district is not intended to supersede sugar beet culture. November 1942: Mr W O Fulton MLA announces Dehydration plant for Maffra, and Cabinet decides on site. That after careful consideration that the dehydration plant for the treatment of vegetables will be established at Maffra. Strong representation was made by Lindenow and Bairnsdale for the establishment of the factory in those districts. However the historical claim of Maffra district was fully vindicated when close inspection of all aspects of the position was analysed. The factory, which will be erected close to and will work in conjunction with the beet factory, should prove a boon for farming, shopkeepers and working men in the district. There is every reason to believe that the dehydration of vegetables will be an industry that will play a prominent part in post-war rehabilitation. The support of the farming community, the plant with adequate quantities of vegetables, will in no small measure decide the future welfare of this undertaking. January 1943: Information released from Canberra today. The Dehydration plant will definitely be established in Maffra, as plans are now being completed. April 1943: A contract from Squire, McBean and Dixon for carpentry and plumbing work, painting, roof coverage and sewer for a price of 6,668 pounds to build the factory was accepted. Foundations and walls have already been built under a previous contract. The work has been classified as defence and has been declared a protected undertaking. A contract was also let to Graham & Naylor Pty Ltd to supply and install steam, water and air services for a sum of 2,180 pounds. A contract for installation of electric light and power at a cost of 1,467 pounds was granted to J P Aarons Pty Ltd in late May. In August two more contracts were let, one for supply of a drum screen screw conveyor and the other for supplying and fixing heat insulation material on air ducting. August 27 1943: A spokesman for the Department of Commerce and Agriculture said today the Maffra plant was designed to handle 375 tons a month, would be engaged chiefly on cabbages, carrots and potatoes and would begin operations soon. Note: I met with Peter and Graham Gunning / Secretary in May 2016 at the GVC, and content and history of the Maffra shed were provided by Peter Quennell who is a foundation member. Photos were taken by Cartalk. ​Photo below: 1930 Dodge DD "Ute" Exhibited by Paula Doherty. Note: Display vehicles are required for GVC.